I need a table like that, although don’t need the wheels. Anyone have any ideas on where to find such a thing? Locking casters make for a happy and versatile workshop. Everything we build gets the wheel treatment, too. We’ve rearranged our 'shop so many times, and every single time, we congratulate ourselves for putting wheels on our tables and cabinets. Do they wobble at all? I copied a mobile work bench design off here (called a Paulk work bench apparently), and put on some good locking casters. I reinforced it with diagonal braces but whenever I jogged the router it would wobble. Couldn’t take the risk of it reuining a carve so I took them off and screwed the whole thing to the wall. Rigidity overrules anytime I’ll need to have it mobile. 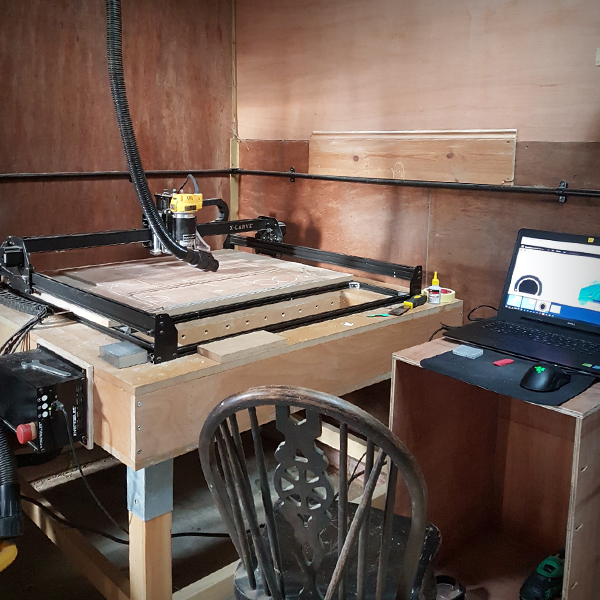 No wobble for us, but our XCarve table is rather weighty. It’s a 1200x1200mmx176mm** torsion box made of 19mm MDF and plywood, on top of 72mm square post legs with cross-bracing. A little jogging of the spindle isn’t going to affect it. ** We made it this thick so we could have a hole with a vertical face for clamping taller objects that we might want to carve. We’ve only used the hole once, but it was one of those things we were happy to have when we needed it. The idea of a way to do vertical clamping was one of the things we came across here in the forums before we bought our XCarve, and when we were planning our table, I suggested we go for it. My husband was happy to do it so long as I drew up the plans for it. We did have to alter the arrangement of the 20x20 extrusion to account for the hole (which spans the front of our carve area). We have another bit of wasteboard that covers the hole, but we just leave it open most of the time because it’s not hard to reach behind the hole to set up jobs, and we have more than enough space for most of our projects without needing to cover the hole. Yes, we are, too… which is why I love the wheels! Would you mind discussing your method for painting the signs from Feb 2017, Mar 2017, Jun 2017 and the Ezri sign from July 2017? These are really great! Did you use the sealer/paint/sealer/paint kind of method so you can wipe off excess or did you use a masking of some sort? Thanks! Maybe my casters weren’t sturdy enough.